On account of the holiday, I took the week off and instead decided to take the easy way out with another Dumb Top Five list. Back in early 2005, the first MMO I played was World of Warcraft, and although I quit in 2013, I still have friends who play and I recently decided to dip my toes back into the waters of Azeroth. I am certain that any WOW vs. SWTOR discussion ends only in madness, but despite everything that World of Warcraft has going for it, I will confess that this blog will not be renamed “This Week in Zandalari” anytime soon. Nevertheless, there are some quality of life features that I’d love to see SWTOR swipe from WOW. Before I begin, I want to state clearly that I’m not a developer or programmer or someone with any actual knowledge of how an MMO-RPG gets made. It’s easy to make suggestions, but I understand that the resources Blizzard can throw at a problem are considerable. Whether what I’m asking of Bioware is feasible is an entirely other issue. I’ll leave that to the professionals. Blizzard’s battle.net launcher is pretty slick, and the thing I most like about it is that it recognizes when I’m logging in from home so that I don’t have to input my password and security key every time I play. I know this only saves a few seconds of typing, but it’s nice feeling like I can jump in to the game that much faster. SWTOR’s launcher received a makeover a few years ago, but I think it could stand a modern overhaul. I don’t really consider myself a mount or pet collector, but over the years I have accumulated dozens of different speeders and critters to the point that I sometimes forget what I have rusting in the garage or going feral in the backyard. Having a better interface to sort through the many jet cars, rocket bikes, fearsome beasts and tiny robot pals I’ve collected over the years would be a welcome improvement. And if such an interface could also include regen items and other toys such as the Life Day Snowball Bomb that would be great and perhaps open up some needed (to a pack-rat like me) inventory space. One of the least fun parts of the MMO experience is waiting for mobs like Trapjaw on Tatooine, Valen Korik on Dromund Kaas, or the Eradicator Droid on CZ-198 to respawn especially if you arrive just as someone else has engaged them. Even worse is competing with your own faction to tag a mob. Multi-tapping allows everyone who hits a mob and participates in fighting it to get credit for the kill and a share of the loot. I believe SWTOR may be one of the last MMOs to not allow multi-tapping, and I think it’s long overdue. In an MMO, you should want and like to work with your fellow players when you encounter them in the open world (outside of PVP, of course). I’ve started running Veteran Mode ops again, and it’s been a lot of fun. But we run once a week, and each week we spend much of our limited raiding time re-clearing bosses we already have killed in order to get to the fights we’re still progressing on. In Warcraft, you can extend Raid lockouts from week to week so that the raid group can jump right into the fights they want to work on without fussing with stuff they don’t. I’d love to be able to do this in SWTOR. Thanks to Galactic Command, we don’t need loot from the early bosses, and skipping ahead to the fights we haven’t done would allow the group to more efficiently finish the operation and move on to the next one we want to learn. My small guild runs a weekly Story Mode ops night and all are welcome. However, it’s not unusual for there to be too many people for an 8 person group but not enough to upgrade it a 16 person operation. There is no worse feeling as a raid leader than asking someone who has shown up to play and have fun to sit out because there just isn’t room. Flexible Raiding gets around this problem by dynamically scaling the difficulty of the instance around how many players are in the group. If you have a couple extra folks, the bad guys will be just a little tougher to account for the extra firepower. I would love to see this system in place for SWTOR’s Story Mode ops. I can see the logic in keeping static sizes for Veteran and Master Modes where mechanics and tuning are more tightly controlled, but if Story Modes are meant for everyone, I say let everyone play. “So I have this idea for a great movie…” and “She sounded like a Murloc!” are two of the little things I miss from WOW. SWTOR’s voice acting is of course one of its best features, but it makes me sad that my characters in SWTOR don’t crack wise using the /joke emote. So let’s do it. Hire some comedians, have a contest, swipe some groaners from dad and get that great cast to record some gags! I realize that at least three of these suggestions would affect other systems in SWTOR. How should loot be handled by multi-tapping? How would extending lockouts influence Conquest where last boss lockout farming is a thing? Should SWTOR adopt personal loot? Should a lockout extend or end if anyone in the group clears the operation? These are problems that are easy to point out, but more difficult to solve. That said, I think they are nuts worth cracking. SWTOR’s debt to World of Warcraft is obvious, but if WOW can adopt AOE looting and finally allow players a choice or two after SWTOR did, then I think it’s fair that The Old Republic can still steal a notion or two from its older sibling too. Last week I had the honor of being invited to participate in the SWTOR Unite event in which members of SWTOR’s podcasting and streaming community teamed up to tackle Gods from the Machine. It was a real thrill to be the Hawkeye on this team of SWTOR Avengers assembled from the Bad Feeling Podcast, the Council, the Escape Pod Cast, the OotiniCast, the Passionately Casual Podcast, ScrublandShad, the State of the Old Republic, the Usual Podcast, and, last but not least, Working Class Nerds! The goal of the event was to unite all these content creators in one place and share their enthusiasm for Star Wars The Old Republic. In that regard I’d say it was a big, chaotic, fun success. Hearing so many familiar voices at one time and in one place was super cool, even before we started killing bosses. While the experience level of the group literally ranged from one extreme to the other, I was impressed with how far we got. No, we did not complete the operation before everyone started falling asleep, but we did come this close to killing Izax, so close that there is no doubt in my mind that we’d have gotten him down with one more pull. SWTOR Unite’s activity of choice was an operation, but it is a testament to the game that it can be a great source of fun for players with many different interests from killing raid bosses and dressing up characters to fighting other players and translating fake space languages. I want to thank Dr. SWTOR and Marcus for organizing the event. I can’t wait to see what madness they have planned next! Relay Junction, What’s Your Function? 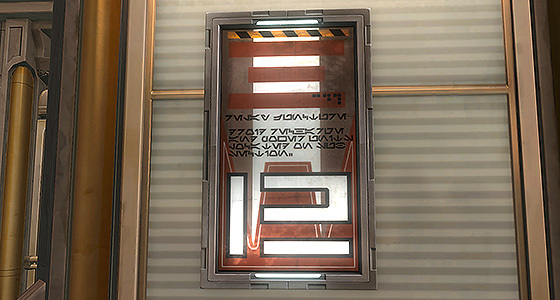 This week’s Aurebesh translation is a work sign that I found on Corellia. I imagine this one provides information for the technical crews who work to maintain infrastructure around the planet’s war torn capital. The sign uses of the term “sub-section” and is similar to others seen around the galaxy. 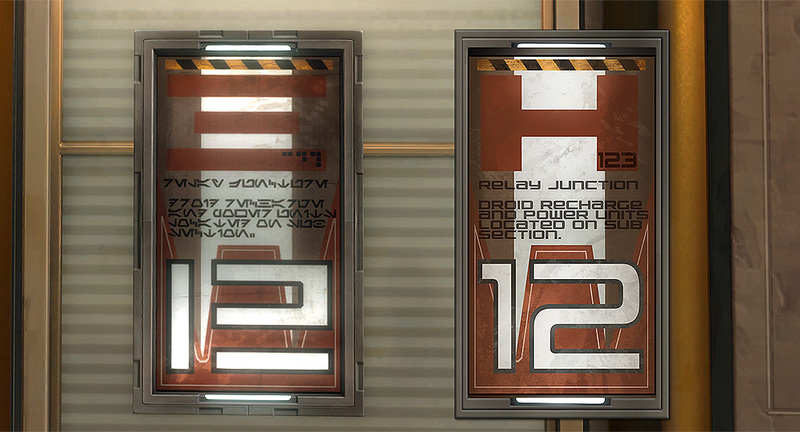 The element that I find most interesting is the design’ incorporation of both of Aurebesh’s number styles: the standard style that closely matches our earthbound numerals and the digital-style with dots and dashes style. The large Arabic numerals clearly work better in the design, but inclusion of the smaller numbers in the alternate Aurebesh form is a neat touch. Here in my neck of the wood, Life Day is rapidly approaching, and I hope everyone’s vacation is filled with clear skies and full bellies!